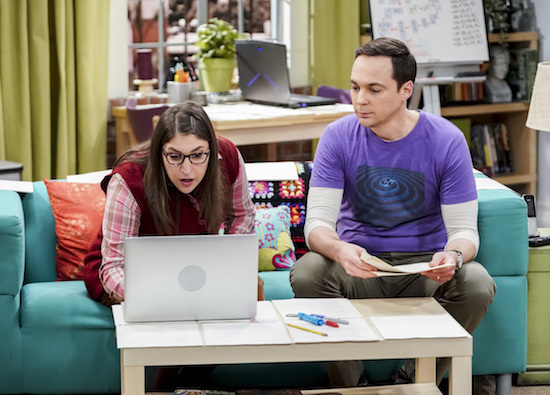 After working on their theory about Super Asymmetry as a couple, THE BIG BANG THEORY’s Sheldon (Jim Parsons) and Amy (Mayim Bialik) are devastated to learn it’s already been discovered—and disproven. "The Citation Negation" - Pictured: Amy Farrah Fowler (Mayim Bialik) and Sheldon Cooper (Jim Parsons). Sheldon and Amy are devastated after learning from a Russian paper that Super-Asymmetry has already been discovered and disproven. Also, ultra-competitive Bernadette asks Stuart's girlfriend Denise (Lauren Lapkus) to teach her how to play the video game Fortnite, on THE BIG BANG THEORY, Thursday, Nov. 15 (8:00-8:31 PM, ET/PT) on the CBS Television Network. Photo: Sonja Flemming/CBS ÃÂ©2018 CBS Broadcasting, Inc. All Rights Reserved.